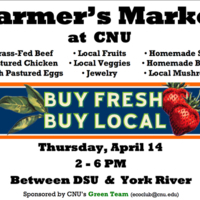 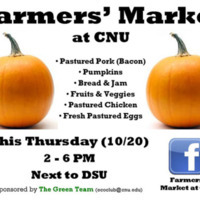 A flier for the Farmer's Market at CNU to be held on April 14, 2011. 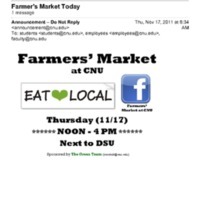 An email announcing a Farmer's Market On November 17, 2011. 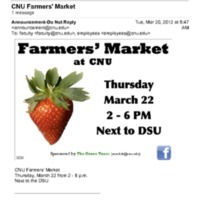 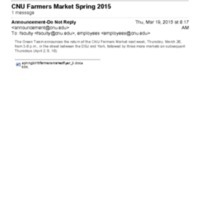 An email announcing a CNU Farmer's Market to be held on March 22, 2012. 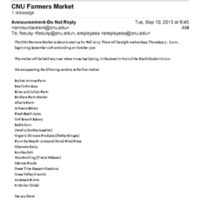 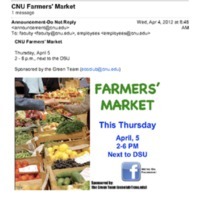 An email announcement for the CNU Farmer's Market on April 5, 2012. 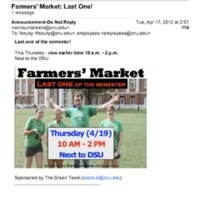 Email announcing the last Farmer's Market for the Spring 2012 semester on April 19, 2012. 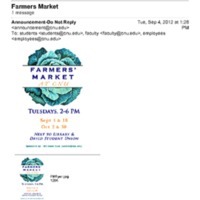 Information about the Farmers Markets to be held Fall 2013. 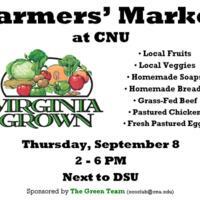 Includes dates and vendors.